Review: Speed Kills / It's Just Movies Review: "Speed Kills"
John Travolta knows a thing or two about speed. As a professional level jet pilot holding a dozen licenses, he has traveled much faster than Ben Aronoff ever did. Even so, Aronoff’s love of speed exceeded anything most of us will ever know. The inventor of modern offshore boat racing, Aronoff was a major promoter, innovator and surf pilot of the monstrously powerful “Cigarette” style racing boats. A streamlined hull with absurd horsepower, these water rockets literally skimmed the top of the rollers instead of going up and down them. In a screenplay vague on details, Travolta plays Aronoff, a successful residential developer who has just moved to Miami to “start a new life.” As it turns out, he is dodging face-to-face time with notorious gangster kingpin Meyer Lansky. Although James Remar does a solid job with the Lansky character, as does Travolta with the Aronoff role, neither imbues their subject with the power required to resurrect this trapped-in-crime trope. There had to be something special in the telling, and there was not. The opening scenes of the movie are on the swinging surf of Miami, where paunchy men in their Sears Roebuck outboards race like Steve McQueen raced motorcycles. It is hard to say whether these scenes are intentionally ludicrous, or if that was just the way the archival footage turned out. 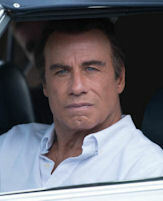 In any event, Travolta does not belong in sunscreen ads, especially when he is playing an ex-mobster. How this incredibly flaky scenario could capture anyone’s imagination is incomprehensible. Even so, it grabs Aronoff like a kid under the Christmas tree. He grabs a boat, and a willing mechanic, blows an engine and a star is born. At this point, directors John Luessenhop and Jodi Scurfield introduce Aronoff’s predictably dysfunctional family. In between scenes of him sleeping with various women, the film cuts to the chase. The racer’s design talents are being submarined by his forced re-entry into crime. The crime is (what else?) smuggling on behalf of the booming drug trade from South and Central America. During all this, there are shady business transactions resulting in Aronoff losing his boat business. Matthew Modine pops up playing George Bush who was, apparently, a fan of offshore racing. In the end, all this is too much information. It detracts from the marginal acting and direction that need all the help they can get. The movie cannot decide if it wants to encapsulate the devil-may-care druggy life style of the times or focus on the soul draining life of crime. How an accomplished local mob lieutenant could think he would simply retire and take up a boating hobby is not explained. The characters fall flat. Honorable mention for Kellan Lutz playing soulless young turk gangster Robbie Reemer who, inexplicably, wins the admiration of the top mob bosses and moves on to dominate Aronoff. In a movie of two dimensional characters he is the only one we love, or love to hate.